…is followed by a Sunday ride to the beach that looks like this. Also, related to the phenomenon described above, your coatrack is overflowing with several seasons of outerwear since you have no idea what the temperature can be on a day-to-day basis. It's taken longer for me to see the signs of spring than usual, since, as you probably guessed by looking at the span of time between my last post and this one, I'm still working on a kitchen in my house, which has all but absconded with my freedom and sense of humor. Even though I have been subjected to one of the worst streaks of bad luck I've ever had - I'm thinking of having the phrase 'It'll have to wait another week' immortalized on the backsplash - and have managed this project so poorly Mike Holmes couldn't even rescue it, I'm still learning new things. For instance - and this is for those of you who know the 'measure twice, cut once' saying - there is actually a missing middle part to that expression: take the measure away, bonehead. But in the last week, things finally began to break my way: I still don't have countertops, toe kicks or a working stove - I am why Hot Plate Futures are through the roof - and until we paint the room we're not going to move the dishes in there. But my parents visited and my dad helped me install 90% of the lower cabinets. That left just a small cabinet to level/install and a breakfast nook for me to make, and while I shuddered at the prospect of using my table saw alone (I practiced dialing 911 with my nose just as a precaution) I finished that assembly injury-free. So now the room looks like a kitchen, which has great psychological value. But now that we're moving on to the countertops phase, a thought struck me: there is a 'dead corner' on one side of the kitchen where the lower cabinets come together. Since it is an empty space unattached to anything, it will be completely inaccessible once the countertops go in. A sealed-off place that is secure but won't see the light of day for 30 or 40 years? Sounds like a great place to put a Bike Time Capsule, doesn't it? Why it should be in the time capsule: Chains are okay when they don't break, but I really like what I've been seeing with belts, which are quiet, light, and no-maintenance. Maybe we'll even go the shaft route like Dynamic Bicycles. Unfortunately, we've stuck with the roller chain for so long I have serious doubts we're going to move far beyond it as a cycling people in 30 years. How a Future Person might describe it. "Look! A perfectly good chain!" Why it should be in the time capsule: Because in the future, we will have surely moved beyond the derailleur as a people. It's the hardest bike part to spell and it isn't easy to install or maintain either. How a Future Person might describe it: "Back in the day, they used to use an apparatus that you would control with a metal wire that would move the chain up and down these differently-sized rings, which gave a bike speeds. Weird, huh?" What it is: A DVD on how you can build your own mountain bike trails (Sustainable Singletrack) published by the International Mountain Bike Association. Why it should be in the time capsule: Because there are an awful lot of details that need to be known, understood and followed in order to make a fun and environmentally friendly single track. It should be watched by everyone who uses a mountain bike trail that they love, for they will appreciate the hours that went into a section of trail your tires may spend a quarter of a second on. How a Future Person might describe it: "Oh, no! I knew humanity was so, so wrong to get rid of the DVD player and store everything in that stupid, enslaving cloud! What were we thinking?" What it is: a Garmin Edge 205 Bike GPS sitting in a bag of rice. Why it should go in the time capsule: Because it would be nice to show people in the future how people like myself would ride and could know how fast we were going, how far, what our elevation was, and how we would attempt a rescue of electronics that had gotten wet (I really did this with my Garmin and it bounced back...but by then I had bought another, so I can put this one in the time capsule). How a Future Person might describe it: "This was before the founders of Googlehoo got their court order to have Googlehoo Optic Nerve implanted into our eye sockets at birth that would display all kinds of - oh wait, I have a call coming in. Shoot, it's sponsored by Angry Birds." 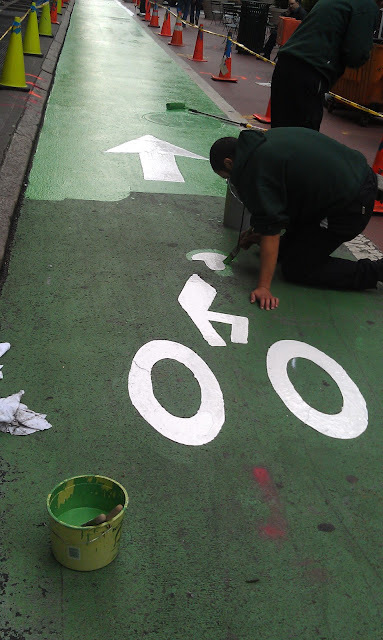 What it is: picture of a guy in New York City repainting a bike lane. Why it should go in the time capsule: To show people of the future how much hard, painstaking work had to go in to create a lane that cyclists would use to keep them safer from traffic. How a Dystopian-Future person might describe it: "Wow, this must have been taken before they abolished bike lanes. Cyclists back then weren't even using them or fighting for them. Plus, they were being rude to motorists by running red lights and the like, so cyclists became abolished soon after." How a Non-Dystopian Future person might describe it: " Wow. This must have been before we had the good sense to make bike-friendly roads, bridges and tunnels everywhere and we didn't need a designated lane for cyclists because cyclists and motorists live in harmony today." And that's all I have for the time capsule; let me know if you have any ideas. However, because all of these things are items that I get a lot of practical use out of, I may not seal the time capsule after all. I may leave something else in the empty space - something I bought in Mexico and provided a great deal of amusement for the guys working the X-ray machine at the airport. I know it doesn't serve as lofty a purpose as the time capsule, but it is a sign my sense of humor has returned - and I'd like to scare the heck out of whoever dares renovate my kitchen in 30 years. Thanks for reading and thanks for riding.